Sometimes you gotta create what you want to be a part of. Use your vision to visualize the movement you want to create. As part of my series about “How to write a book that sparks a movement” I had the great pleasure of interviewing Simone Edwards. Making people smile is what Simone Edwards has done, on and off the basketball court, her entire life. Born and raised in Kingston, Jamaica, the 6’4” former center is the first Jamaican player to be signed to the Women’s National Basketball Association (WNBA). As a high school senior, Edwards was offered a full scholarship to an American college — but only if she learned to play basketball. Frequently referred to as the “Jamaican Hurricane,” Edwards is famous in the WNBA for her fan-favorite “Shimmy Shake” and her record as one of the top rebounders in the world. She first garnered attention on the court during junior college, at Seminole State College in Seminole, Oklahoma, leading the team to an undefeated conference record, ranking in the National Junior College Athletic Association Top 10. During her tenure, she was the recipient of several top sports awards and became the First Kodak All-American in the school’s history. Edwards’ junior college success carried over to her time as team co-captain at Division I University of Iowa. 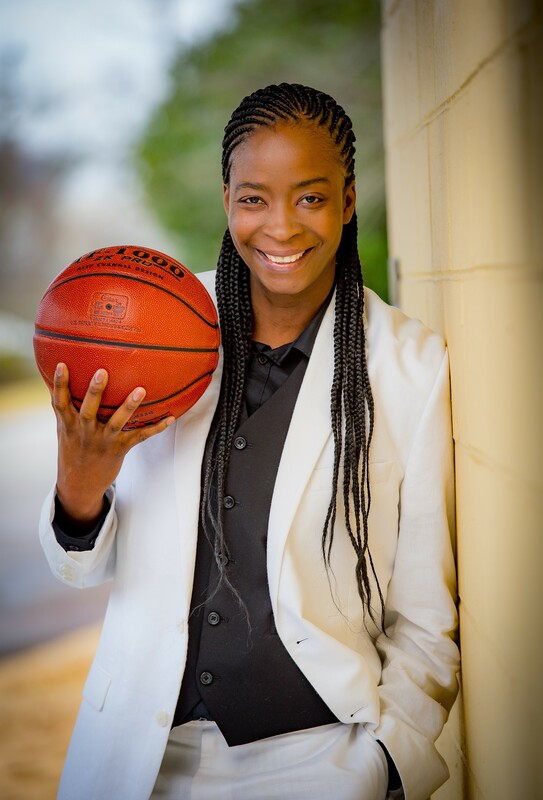 Upon graduating, Edwards was signed to the WNBA New York Liberty during the 1997 inaugural season, becoming the first Jamaican player signed in the WNBA. She gained international prominence as a basketball star in Italy, Hungary, Israel, and Spain leading teams to championships including the Israeli Cup and the Spanish Copa de la Reina. In 2000, she signed with the Seattle Storm’s inaugural team, ultimately becoming a WNBA champion in 2004. Edwards announced her retirement after a six-year career with the Seattle Storm in 2006, retiring as the longest-tenured member on the original Storm roster. Post-retirement, Edwards was selected to represent her home country as team captain on the Jamaica Basketball Women’s National Team, winning the country’s first-ever gold medal at the 2006 Caribbean Basketball Confederation Championship; and in 2014, she returned to the team as head coach, winning yet another gold medal. Edwards is a member of the Seattle Storm All-Decade Team and the Seattle Storm Legend Fraternity, and she was named an NCAA Women’s Basketball Ambassador. In 2015, she starred in the award-winning documentary feature film Coming Back to the Hoop, coaching senior women to the Senior National Basketball Championship. As part of her lifetime commitment to philanthropy and community service, she founded Simone4Children Foundation to uplift and educate children in Kingston and inspired by the bullying she experienced from childhood to college, she also created The Anti-Bully Project as a champion in the fight against bullying worldwide. In 2017, the Jamaican government bestowed her with the Order of Distinction award for her outstanding contribution to Jamaica’s Women National Basketball. Edwards is a highly sought-after motivational speaker who shares her incredible personal stories of success, failure, and determination. As the co-founder of Diverse Writers Room, a literature, television, and film content creation company, she published UNSTOPPABLE, a memoir of adversity, perseverance, and triumph. For more information, visit her site at www.jamaicanhurricane.com. My backstory is that I grew up in a gang-infested impoverished village in Kingston, Jamaica, where water and electricity were just as scarce as hope. Extraordinarily tall since a young age, I started running track to gain popularity to combat bullying. By the time I was a teenager, I was an undefeated track runner with hopes to gain a college education, however on my final championship race, with scouts present, I devastatingly experienced my first loss. Performing on the track field better than I had imagined, I was instead scouted by an American basketball coach. I was then offered a full scholarship, but only if I learned a sport that I didn’t even know existed. This unimaginable opportunity gave me determination and optimism of hope. then navigated the astronomical challenges faced with transitioning to American culture to becoming the First Kodak All-American in the school’s history, and ultimately to the rise of becoming the first Jamaican WNBA player. As a little girl, there was no access to a library near my village, so we used to climb into the landfill to find books. I would escape into a fairy tale to distract from the harsh realities of my life, and in particular was fascinated with the story of Cinderella, which mirrored with my life at the time, since its main character struggled with the odds against her, yet she still clung to hope for a promising future. I would read this fairy tale each day as inspired my life to prepare for a happing ending. As I reflected on the tribulations from the harsh realities of poverty in a third-world country, I realized that with great power comes great responsibility. I knew that there was a hopeless young girl or boy, particularly in the Caribbean, who needed to see someone who could relate to their struggles and pain, that became a success story. This is a story about adversity, hope, resilience, and sacrifice. But, it’s also just a story of a poor girl with big dreams that some called impossible. The impact I hoped to make was to show readers that your current circumstances don’t dictate your future. The actual results exceeded my expectations, as I am now sought after to travel the world to further share my life’s story through public speaking. The overwhelming responses of how the book has changed, enhanced and informed thousands aligned with the purposed goal. The book started a two-fold movement: one being an anti-bullying movement that propelled the success of The Anti-Bully Projectand speaking tour that has reached thousands of youth in America and the Caribbean; and secondly when I was invited to United States Department of Homeland Security to share my story: the fulfilled journey of an immigrant fighting for an American dream. Right away, readers felt empowered and inspired to create a path for a better life. The most frequent feedback from readers is that the book pushes them to do more and be more. It’s not easy to experience this cathartic experience, but I can honestly say I poured everything into the book. It’s courageous yet filled with the vulnerability I didn’t know I was willing to share. Another fulfilling experience was readers taking away every kind of lesson, good and bad. Non-fiction books include the narrative structure of real-life accounts and lay out the degree of authenticity required to depict the protagonist’s layered evolution. For my book, Unstoppable, this inspired a power to create true change, since it allows the reader to not only journey through the experiences of a determined girl turned professional athlete, but also the story of an immigrant and foreign student from a perspective rarely captured. Drawing parallels between basketball and the habit of discipline. Basketball teaches you how to use the strategies of the game to rebound any obstacle and overcome any adversity on life’s court. No matter what the situation, basketball provides you with the tools necessary to dribble through a court of opponents, move the ball forward, make the basket, and achieve the end goals. Rejection! I never would have self-published if the publishing industry had shown interest in my book. I couldn’t get literary agents’ interest in my manuscript. However, now exceeding expectations, the book has been adapted into a screenplay and now I’m in the process of seeking a production partner. The biggest lesson learned is confidence and persistence are key in life, so never give upon yourself. 1) Believe in your cause. I was bullied and grew up in poverty, so I knew what it feels like. I was an immigrant who fought for the American dream, so I knew what it feels like. You must stay true to yourself. 2) Make sure you reach the people who can relate to your movements. I reach and inspire thousands of youth living in poverty-stricken areas and inner cities; immigrants, aspiring athletes, and women. 3) Spread the message that anyone can transform her/his life. Whenever I speak throughout the world, I always remind people that their present circumstances do not dictate their future. 4) Sometimes you gotta create what you want to be a part of. Use your vision to visualize the movement you want to create. 5) Don’t ever let rejection stop you from achieving your dream. I have been rejected, ignored and dismissed but never once gave up because you must believe in your life’s purpose. A movement that I had hoped someone would start was recently started by sociocultural researcher Jobi Tyson to break the stigma of female childlessness and advance infertility and childlessness research — through her organization The National Association of Involuntary Childlessness.